﻿ BBC iPlayer Radio - play BBC radio programmes from the last seven days. This application lets you play BBC Radio programmes from the last thirty days that they make available through the iPlayer website. It's designed to be very simple to use for screenreader users: you can select and start a programme easily. However, you can also change volume, jump around the programme and pause and start easily. BBC iPlayer Radio is free. You can get it from the link below. You have to run the setup.exe file that you get from the link, and everything will be installed for you. You will then have a desktop shortcut called "BBC iPlayer Radio" you can use to start the program. You can also find "BBC iPlayer Radio" in your Start menu. Installer for BBC iPlayer Radio Run this MSI file to install BBC iPlayer Radio. A simple list of stations leads to a simple list of programmes, so you can select and start any programme with just the cursor keys and return. No need to navigate the complicated BBC website. Jump to a particular point in the programme, or skip forwards and backwards easily to get to the place you want in the programme. Pause and restart at any time with a single keypress. You need to be on Windows 7 Service Pack 1 or later. 32- or 64-bit versions are all supported. Earlier versions of Windows probably work too. Some people have encountered a problem where none of the radio stations load. Instead you get an error message when you start the program that says the configuration failed to load. This can be fixed by opening Windows Explorer and navigating to C:\Users\Your-Username\AppData\Local (where "Your-Username" will vary according to your username on the machine). Delete the folder there called Accessible_and_WebbIE and the program should start normally again. The BBC changed the service again, and it has taken me some time to sort it. The progress indicator for downloading is now useless - it just says "Downloading" and does not tell you how far it has got - but the program downloads and plays again! Also, I've improved the metadata in the resulting MP4 files, which is nice if you play them with another program like Windows Media Player. Future versions could improve the metadata more, and show progress bars again, but that's for another day! The BBC now provides thirty days of radio programmes, so the program now handles loading this bigger list without hanging. MP3 files produced by the program have the title and album properties set to make it easier to manage them. Should now produce higher-quality 192kbps audio files. You probably won't notice this unless you are listening to BBC Radio 3. Another attempt to fix programmes skipping as they play. Experimentation shows that the problem is not my downloading code, as I thought: the same file is downloaded each time, and it plays fine in the VLC media play. But both Windows Media Player and my program skip at exactly the same point. My program uses Windows Media Player internally, so there appears to be a problem. To fix this, the downloaded AAC files will be converted into MP3 (by FFMPEG): testing shows these play fine. Takes more time, of course. Fixes programmes skipping as they play. Thanks for the many reports. Fixes the toolbar buttons displaying on high-resolution screens. Fixes the volume control not doing anything. Removes the firewall changes made in 9.3.0 since actually reading the documentation indicates these are wrong. Removes an incorrect configuration setting that might have caused problems on Windows 7 machines without .Net 4. Some people have reported problems with getting the BBC data from the WebbIE website, but the error message isn't helpful, so this version has an expanded error message to help me debug it. 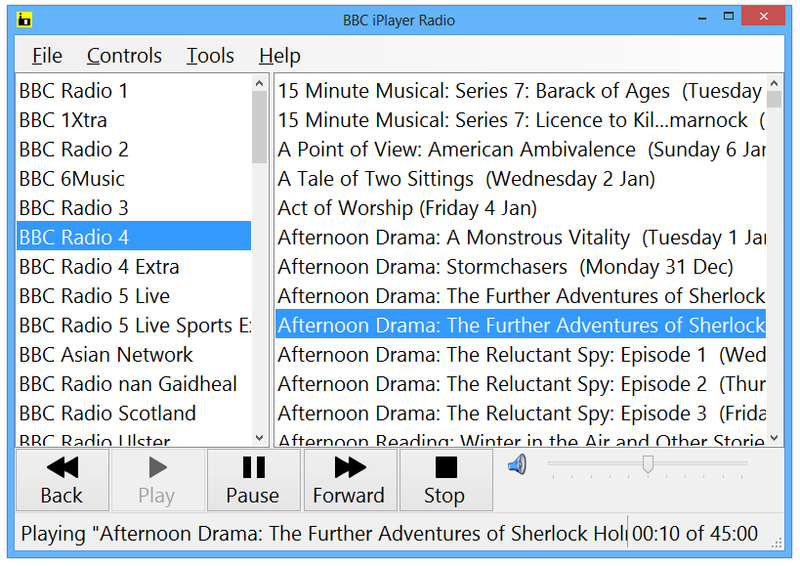 BBC iPlayer Radio now adds itself to the Windows Firewall exception list, which should improve connectivity for users. Bugfix, restoring ability to download programmes after BBC change in data stream this week. Added options to view and delete the downloaded programmes: look in the Tools menu. Some people seem to have problems that are fixed by doing this, so make it easier for users. Version 9 worked with Windows 8 and later, but not Windows 7 or earlier. This version works with Windows XP and later, by converting the downloaded AAC file into MP3. The BBC turned off their Windows Media streams at the end of February, which completely killed this program. This version accesses their new AAC streams. This means that the program operates slightly differently: it now has to download a programme before it can be played - you get a progress bar. The media files are AAC files, so you need support for that in Windows Media Player. Bugfix to 8.4.0: fixed radio stations not showing up in Windows XP. TeamViewer can be launched from the Help menu for support. Improved tabbing and screenreader support. Control+C will copy the programme name. Radio programmes from the BBC West Midlands station are now available. Fixed a bug with loading the station information: you should now see about eight more programmes per station that did not appear before. Added View option to only show programmes from a day in the past. Fixed update and activation bugs. Changed skip time to 30s. Fixed alt key access to Stations and Programmes list. Fixed a bug with updates. Previous versions won't update automatically, but new versions will.